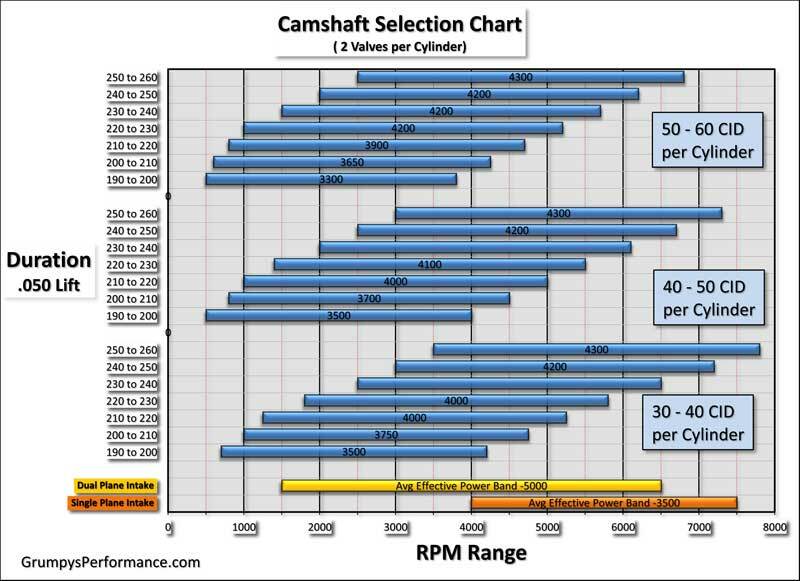 I'm building a mild performance, 9:1 static CR, 350 for my 55 and looking into camshaft choices...I understand the intake closing point (degrees) will affect the dynamic compression ratio (DCR)....My question is what DCR should I be shooting for? and what rear gear and stall speed should I get? THESE CALCULATORS COME CLOSE, and may be very useful, that question, of Which gears to go with comes up frequently. 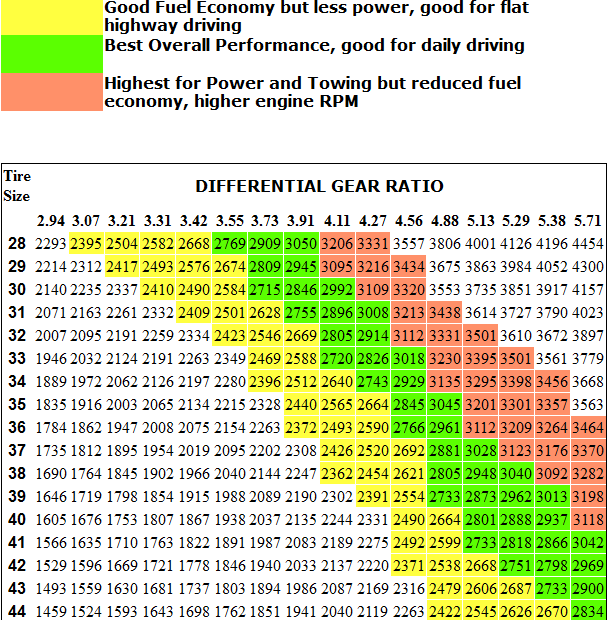 (youll generally want to select a rear gear ratio that multiplied times your transmission first gear ratio falls in the 10:1-10.5:1 range, for performance cars used on the street, with tires in the 24"-28" tall range)reading thru this thread and sub linked info should help, and yes, knowing your engines power curve and tire size and transmission gearing can help a great deal in selecting the correct rear gear ratio, and the use of over drive ratios adds to the flexibility of the choices. your obviously going to need to consider tire diameter, rear gear ratio and transmission gearing, generally your want the first gear in the transmission multiplied times the rear differential gear ratio to fall in the 10:1-10.5:1 range and cruise at a bit higher rpm that the torque converter stall speed in 1:1 gearing, if you have a over drive gear having a lock-up converter sure helps and a trans fluid cooler is almost mandatory if you have a high stall speed torque converter.
" GRUMPY, I Installed the Richmond 3:54 gears for my Dana 36 from Summit Racing. The part number was RMG-4901431. Good choice, the vette woke up and runs like a bat out of hell." keep in mind the rear gear ratio you select depends on BOTH the tire diameter and type of transmission you run, over drive ratios tend to help.Also depends on what size rear tires you plan to use. notice changing the stall speed and shift points , by about 1000rpm, on both ends of the power band on the identical engine , being used on the transmission allows you to access a great deal more power from the engine far faster , the drive train change can easily result in 30% plus more power reaching the rear wheels, but it also allows you to select a longer duration cam, and is usually further enhanced with a matching change in rear gear ratio, from lets say a stock 2.87:1-3.08:1 to a more power transfer friendly 3.54:1-4.11:1 rear gear. 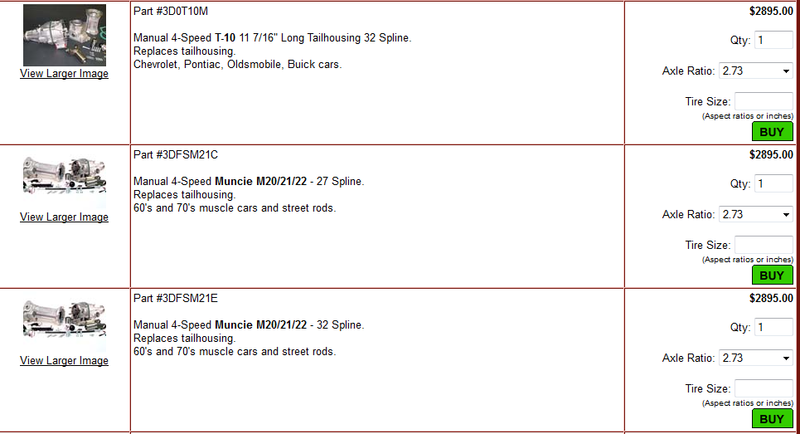 Example:lets say you run a muncie 4 speed manual transmission, M20 (1:1 4th gear), 27" diameter tires, 4.11 rear gear, and 60 MPH means the engine is running at 3090 PRM. 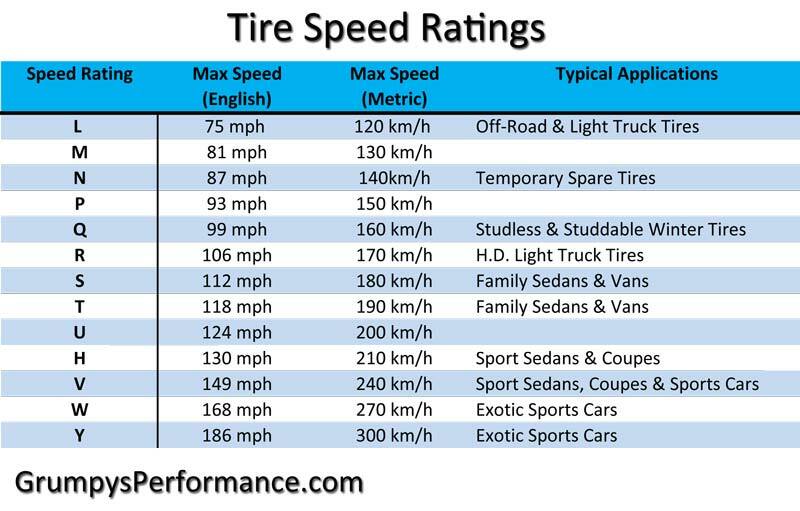 If the tires are 26" then it's at 3200 RPM. 25" goes to 3300. If you want to actually keep up with traffic at 70 MPH then the numbers are 3600, 3700, and 3870, respectively. Another example: M20, 27" diameter tires, 3.31 rear gears, and 60 MPH has the engine spinning at near 2400 RPM's, at 70 MPH it's at 2890.
two engines producing the same HP at different RPMs will, given appropriate matching gearing, produce EXACTLY the same torque and EXACTLY the same HP at the wheels - provided, of course, equal amounts are lost within the drive train. and thats true, but in most cases, cars are geared to maximize mileage to some extent the big block tends to have a broader torque curve that comes in at lower rpm making the gearing far more effective, its not PEAK power that counts its AVERAGE POWER. in the useable RPM BAND. I constantly see guys who want to build a small block that will make 500hp at 7500rpm, then gear the car so the engine spends 90% of its time in the 1500-5500 power band, then they as why the cars a dog. keep in mind , that if you select the cars rear gear and transmission gearing , correctly that your engines power band should be easily accessed by the cars gearing and allow the car to operate most of the time in or near its peak torque curve. Realistically youll want to think thru the entire combo of engine and transmission, gear ratios, tires sizes etc. and keep in mind , that if the engine in front of the transmission and its rear gear ratio makes decent power , the ratio of gearing the car has will be of less concern, to your cars acceleration, potential. yes you should ideally get as close to 10:1 with the first gear ratio x final differential ratio,as you can to maximize the potential ,but if you have built a well matched combo with decent compression (usually near 10:1 if your going to use pump octane gas)and as much displacement as you can easily afford (383-406 in most small blocks and 454-496 on most big blocks when your trying to keep costs down) youll have little trouble spinning the tires with minimal effort even with less than ideal gearing , many guys fail to match the cars gearing to the engines power band, but just as many fail to build a well thought thru combo with matched components. the main idea of matching the drive train gear ratios is to keep the engine in its intended power band during the vast majority of its operation. if youve got a 2.87:1 rear gear you'll spend a great deal more time in the 1500rpm-4500rpm band than if you have a 3.73:1 rear gear ratio simply because the engine can accelerate faster thru its power curve with the 3.73:1 rear gears. 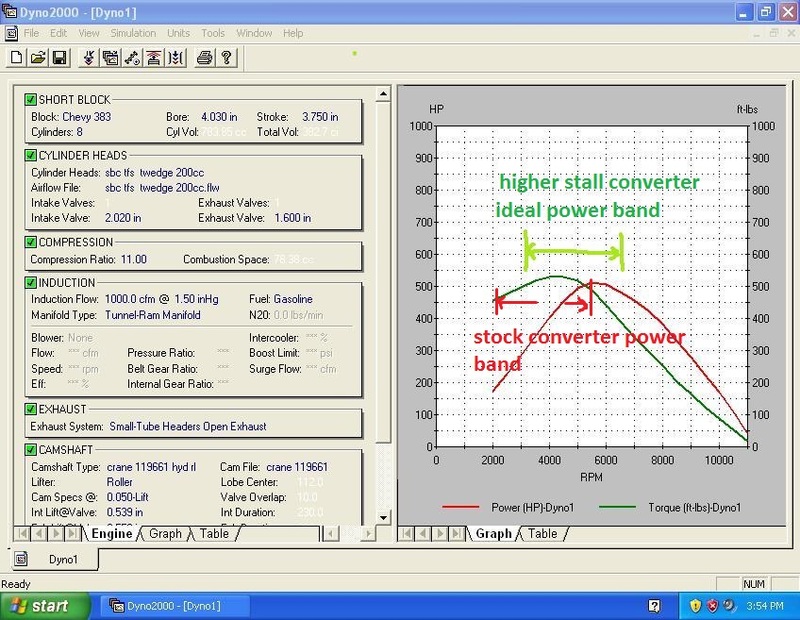 It should be obvious that knowing the engines effective torque curve will be critical, and keep in mind that horsepower (THE ABILITY OF THE ENGINE TO DO WORK) goes up as the AVERAGE rpm band goes up if the torque remains constant or even similar. 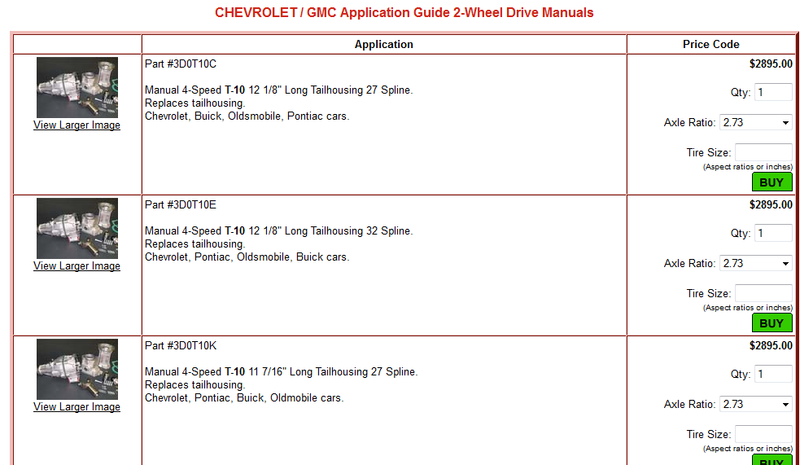 if the tire height is under about 28"
if the tire height is over about 28"
IDEALLY you would sellect the horsepower goal, and the displacement,youll work with too reach that goal. then the cylinder heads, intake and exhaust are sellected that supply the necessary flow rates,in that rpm band, you pick the cam too match the intended rpm band,and flow rates and power range for the application, you then match the compression ratio, to the cam timing too maintain the correct dynamic compression ratio, and you sellect the matching drive train and gearing to keep the engine IN the matched rpm band the vast majority of the time. 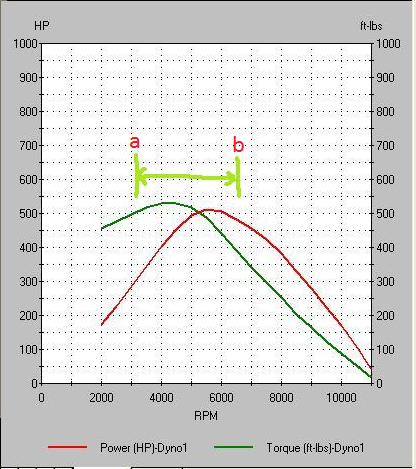 In most cases the upper rpm band limit is either limited by valve float with the more common hydraulic lifters, or the auto transmissions shift rpm point,(yes there adjustable in some cases but rarely shift higher than 5500rpm-6000rpm even with a shift kit installed) theres not much point in designing a combo that runs into potentially higher rpms if you'll seldom reach, or can,t reach them., the lower rpm limits set by the necessary minimum lower rpm band the cam and compression ratio , and engine displacement will allow the engine to smoothly produce power from.
" GRUMPY?? I plan on adding a mild cam into the mix on my TPI corvette?. whats the ideal power range in the TPI? " a 2800rpm-3000rpm stall converter and ideally a 3.54:1-3.73:1 rear gear really wake up even a stock tpi corvette engine, but become almost mandatory when you upgrade the cam. the stock TPI starts to get restrictive at about 4500rpm with the stock cam, by about 5500rpm its pretty much a lost cause UNLESS you do a bit of porting, add a better cam and ideally better cylinder heads, theres a nearly endless list of improvements that can be made, but to get the power efficiently to the pavement it helps top have the engine spend most of its time in the 3500rpm-5000rpm power band, thats what the higher stall converter, and rear gearing do. trust me ask around to those guys who have done it, adding a 2800rpm-3000rpm stall converter and ideally a 3.54:1-3.73:1 rear gear really make the car come alive! if you look around youll find guys that forgot that, fact, and concentrated totally on engine upgrades, they eventually find that the car just never responds correctly or they eventually learn and get the drive train matching the engines power curve. btw once you use it to find that approximate lift ,duration and lca, you can buy any companies cams with similar specs. Most auto transmissions are either adjustable,OR PROGRAMMABLE in some cases, or there are aftermarket shift kits available too alter the shift points or convert to manual operation, but in most cases you'll still find 5500rpm-6000rpm about the max possible shift point, and frequently you can,t get quite that high with the less expensive kits. for a street car the shift points are lower so the cam selected should be milder to match the realistic rpm band that's actually in use! we've all made mistakes its how most of us learn, at times, I spent several hours when I was 18 years old replacing a pressure plate and clutch disk in my 1967 firebird Id just installed a 455 Pontiac stroker engine in, unfortunately I managed to have the wrong side face the fly wheel, face the clutch pressure plate, so the clutch would not function, I had to pull it all back out, flip the disc and reassemble, converting what is normally a 2-3 hour job into a 5-6 hour job. then, I absolutely cooked the clutch because the disc Id purchased was not top quality, and the pressure plate was a stock diaphragm style not suited to race use, like the 3800 lb borg and beck that I replaced it with, (not knowing the difference at that time, cost me a good deal of time and cash doing something over that I should have researched nd done correctly the first time, but hey I was 18 and knew everything at that time!) so I had to repeat the job with-in weeks but it was a huge learning experience and I learned a great deal about how things worked, what parts to buy and how to check out things along with a great deal more info, like large sticky slicks and a high torque 455 Pontiac engine (stroker crank this was before the factory 455) with a 4 speed and a 3.36:1 rear gear are not the ideal combo for long clutch life. the 3800 lb borg and beck pressure plate, Zoom disc, lake wood bell housing, hays flywheel, and 4.11:1 rear gears that I replaced it with,lasted several years until I eventually sold the car. After you've figured out how fast you want to go, you need to find the weight of the car and determine how much horsepower you'll need to accomplish your goal. The formula to estimate amount of horsepower for a terminal mph in the quarter-mile is: hp = (mph / 234)3 x weight. As an example, if your car weighs 3,000 pounds, you'll need about 500 hp to run 130 mph, and if your car weighs 4,000 pounds, you'll need about 685. This is simply a power-to-weight calculation, and experience has shown us it is a little conservative, much depends on the engines torque potential. There are a lot more factors involved in goin' fast, but this is a good place to start, and it shows why weighing less is better. The next thing you need to do is find out where your engine will make peak horsepower and pick a rear gear that will put the engine at about 200 rpm above that number going through the traps in High gear. 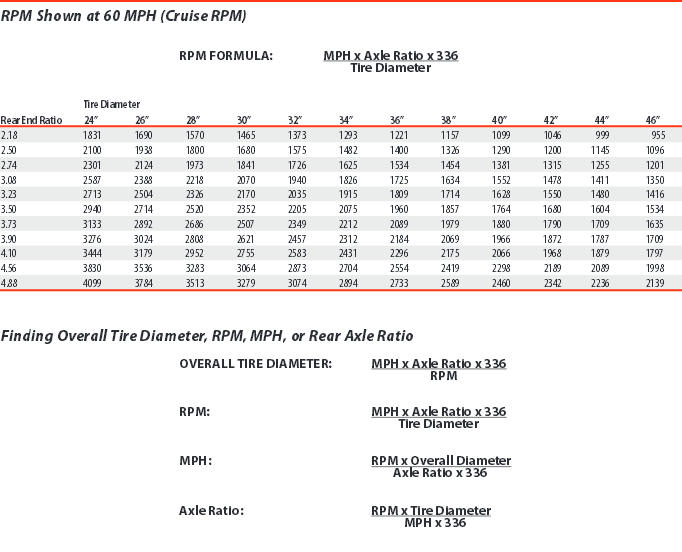 Here is the math: gear ratio = (rpm x tire diameter) / (mph x 336). This is closely tied to the size of the tire you are going to run, so before picking a rear gear ratio, find the largest tires that will fit under the rear. You should also note that an automatic transmission in High gear will exhibit about 5 percent slippage, so you will need to add that to equation. Even a correctly rebuilt TH350 or 200r4 should easily handle a t-bucket or light weight car,due to the light weight, but as car weight is increased the stress levels and heat increase also. , but a good trans cooler is mandatory on a high stall converter equipped transmission, for durability. I would point out that a well built TH400 or a 4L80E IS STRONGER than a similar TH350 so even if you go with a stock trans Id go with the TH400,or 4L80E, it weights a bit more and will absorb a bit more power but durability is more important in the long run than a couple hundredths of a second in et.especially in a light weight car that should have little problem scaring the hell out of you if properly built! 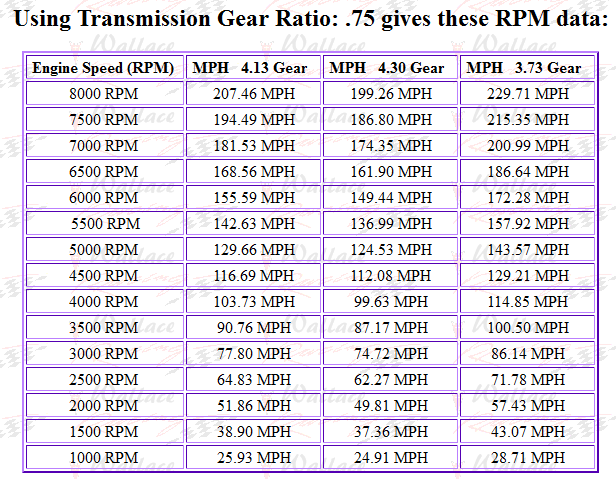 I got EMAILED asking how and why swaping gear ratios works and why if your using the same engine does it even matter? first you need to under stand that the rear gear ratio and the transmission work as a combined team to provide the transfer of rotary force from the engine to the pavement. so the KEY is both KEEPING the engine IN that effective torque production range and having the most power strokes applied to the pavement thru the drive train. where most guys go wrong is in not correctly matching the cars stall speed and gearing to the cars tq curve, if you mod the engine for increased high rpm performance but fail to also match the stall speed and gearing to that higher rpm tq curve much of the potential improvement is wasted. you should readily see that a trans that shifts at 5000rpm will work in the first example but would waste most of the power curve in the second example,where shifting at 6500rpm under full power acelleration would make more sence. 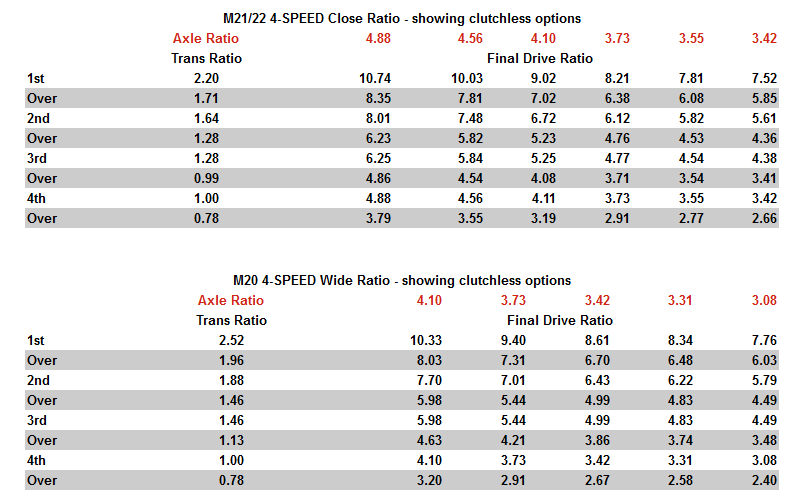 a 3.08 rear gear and 700r4 trans matches the first example well but it would take a swap to a 3.73-4.11 gear to allow the engine in the second example to keep its most effective power band matching that second power curve well. POWER (the rate of doing WORK) is dependent on TORQUE and RPM. Using the black curves as an example, note that the engine produces 500 HP at both 4500 and 5400 RPM, which means the engine can do the same amount of work per unit time (power) at 4500 as it can at 5400. HOWEVER, it will burn less fuel to produce 450 HP at 4500 RPM than at 5400 RPM, because the parasitic power losses (power consumed to turn the crankshaft, reciprocating components, valvetrain) increases as the square of the crankshaft speed. The RPM band within which the engine produces its peak torque is limited. You can tailor an engine to have a high peak torque with a very narrow band, or a lower peak torque value over a wider band. Those characteristics are usually dictated by the parameters of the application for which the engine is intended. An example of that is shown in Figure 4 below. 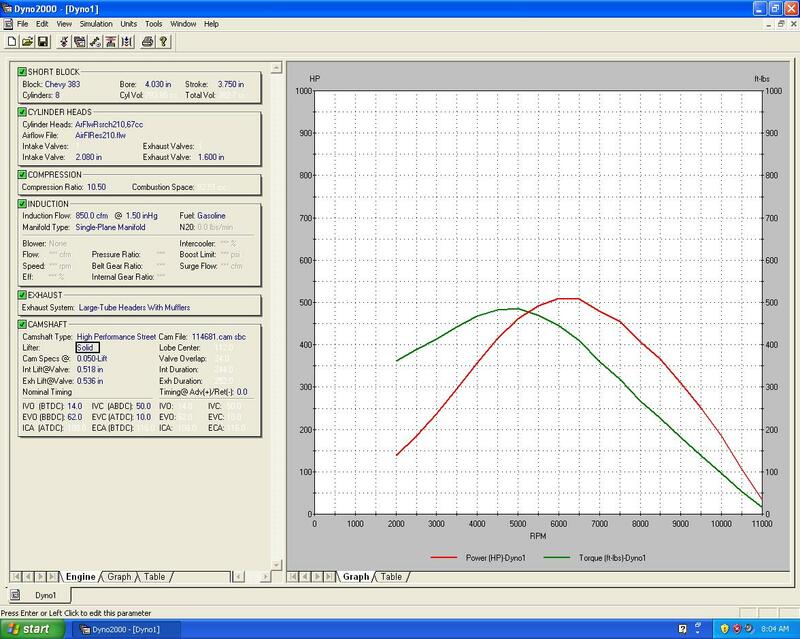 It is the same as the graph in Figure 3 (above), EXCEPT, the blue torque curve has been altered (as shown by the green line) so that it doesn't drop off as quickly. Note how that causes the green power line to increase well beyond the torque peak. 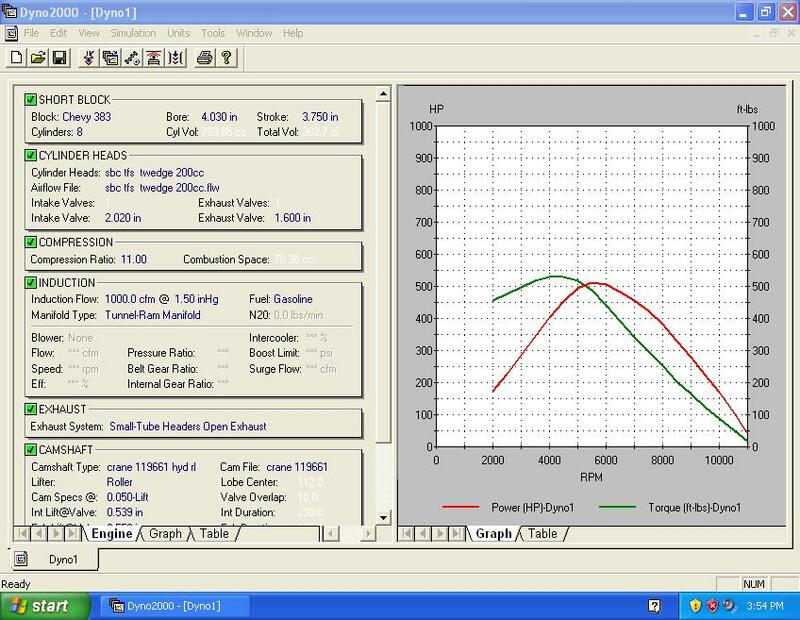 That sort of a change to the torque curve can be achieved by altering various key components, including (but not limited to) cam lobe profiles, cam lobe separation, intake and/or exhaust runner length, intake and/or exhaust runner cross section. Alterations intended to broaden the torque peak will inevitable reduce the peak torque value, but the desirability of a given change is determined by the application. BTW the factory 700r4 that comes in some corvettes is designed for about 350 ft lbs of tq, it can be strengthened, but its not and never will have the strength of the 4L80E. or TH400. the factory 700r4 should work for quite awhile if your trans fluid temps are kept under about 210F MAX, its HEAT more than TORQUE that kills transmissions when were talking about mildly modified engines, the transmissions designed to work with 350ft lbs according to G.M. but theres thousands of them working at the 400 ft lb levels, remember only your PEAK hp/tq levels will even come close to exceeding the design limits. you know its great feeling to find your dealing with someone who actually takes the effort to read links and understand the basic concepts posted! Ive been trying to point out stuff like that for 40 years and you might be absolutely amazed but Id bet 90% of the guys looking at those two graphs , would instantly pick choice (B) based on only seeing the higher peak numbers alone and in about 90% of the cases (A) would make the better choice for an engine designed for street use and Id bet a great deal of money 99% of the readers would bother to actually compare the two graphs point vs point. 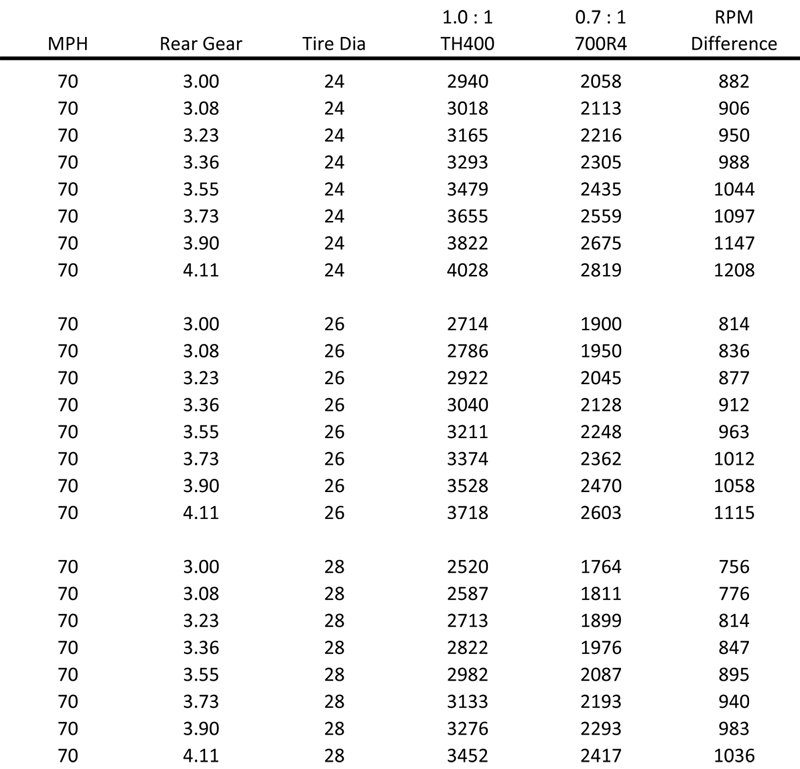 Id also point out that a good street/ strip engine combo tends to have torque numbers peak at roughly the same levels (with-in about 15%) as the hp does and with at least 1000rpm or greater between the peaks and all after 3500rpm and before 6500rpm , thats assuming the rear gearing and converter stall match the engines effective power band of course . when the two peaks occur earlier in the rpm band you tend to need to constantly shift gears, when it hangs on above 6500rpm you tend to develop long term valve train durability issues..
something like this would normally result it a fun street combo in your average muscle car with a 3.54:1-3.90:1 rear gear a 4 speed and 26"-28" tires, having an over drive trans is also a big help. anyone tried swapping to a 6 speed auto yet? Type: six speed RWD / AWD, electronically controlled automatic overdrive transmission with torque converter clutch. Clutch-to-clutch architecture, with integral Electro / Hydraulic Controls Module. Max Gearbox Torque: 885 lb.-ft.
Max Gearbox Torque: 664 lb.-ft. There are two torque converter sizes, 258mm and 300mm. The 258mm applications use a twin-plate torque converter lockup clutch, while the 300mm applications use a single-plate torque converter lock-up clutch. Both types of clutches make use of GMâ€™s proprietary electronic controlled capacity clutch (ECCC) technology, which uses a small, regulated amount of slip to dampen out engine pulses. This creates a smoother running drivetrain, especially during shift events. A wide overall ratio spread of 6.04:1 allows a â€œsteepâ€ first gear, as well as very â€œtallâ€ overdrive top gear for low-rpm highway cruising. Acceleration is maximized, as is fuel economy. Engine noise is also lower during cruising. Both fifth and sixth gears are â€œoverdriveâ€ gears, for example. Gear changes from second to sixth gears are accomplished with clutch-to-clutch control, where an oncoming clutch is engaged and an â€œoffgoingâ€ clutch is released in a precise manner to achieve the ratio change. The first-to-second upshift, however, is a freewheeling action, where the second gear clutch engages while the first gear one-way clutch spins freely. This allows a greater degree of smoothness at lower vehicle speeds. The clutch-to-clutch shifting and single freewheeler allows significant reductions in packaging requirements and, as a result, the new six-speed is nearly identical in size to the four-speed transmission it replaces. HEY GRUMPYVETTE, my th350 is on its last legs and I want to upgrade to an over drive transmission, I can get a 700r4 or 200r4 for about the same price, whats a better transmission? 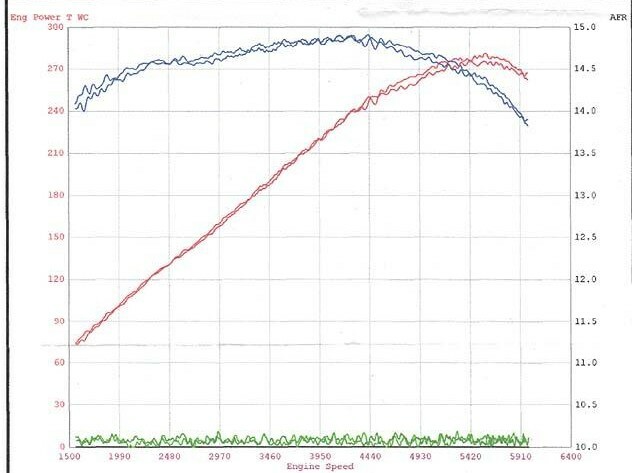 this debate on the difference in strength between the rebuilt 200r4 and 700r4 has gone on for years, both transmissions have guys that say they can build them to handle outrageous power levels , but the evidence I see it that the well built 200r transmissions seem to hold up longer once you start hitting them with over 500-600 ft lbs of torque on a regular basis. and neither of the transmissions can equal the heavier built 4l80e once you start using that power level on the drive train. or put a different way, Ive seen a lot more 700r4 transmissions that failed than the 200r4s but they both lack the strength and parts mass/size of the 4l80e, but that also posses a problem in that the 4l80e is larger and heavier and more difficult to fit in a trans tunnel and can require a expensive control module, so you might want to think thru your goals, and cost if your swapping transmissions to hold a significantly more powerful engine swap in your car, as its rather foolish to need to go thru the process TWICE or THREE times in a quest to find a transmission that won,t grenade on you once you start beating on it! well as unlikely as it is most times, he actually followed that advice and installed the 3.73:1 rear gear and 3000rpm stall converter, heres what he had to say after just those components were changed with no engine mods yet done! "I just thought I'd let you know how much of a difference there is in the feel of my corvette after swapping to the 3.73:1 gear ratio . I usually drive my car only around town, short trips like to the store, and rarely get on the interstates where I have to run 55 - 70 mph ,so the change was great, but My stock TPI engine seems to have gained a great deal more power, and the cars much more fun to drive, I was worried about the 3000 stall, but your correct, its not that bad if you drive like a sane person and only really allows the car to rev a great deal higher than stock if I floor it, yes theres some obviously higher converter slip but nothing drastic.. Between the higher stall converter speed and rear gears, The motor really revs up much faster now, and under WOT and breaks the tires loose on the 1-2 shift and 2-3 leaving two long black tire marks that are about 4 1/2 car lengths on the 1-2 shift and 2 car lengths on the 2-3 shift before the changes it barely spun the tires in first and only chirped them on the 2-3 shift"
Knowing how much torque you are applying (this assumes you have perfect traction with only a 10% slippage at your slick) to the axel here is a chart of aftermarket axels listing their failure points (on average). 40 spline axel________1.710" dia. _______ 12,000 lbs.-ft. Here is a web site with a great graphic that shows why spline count is so important. Beach Bum wrote: think a lot of people do not understand the effect of gearing the 700R4 has on the most important gear for acceleration, which is 1st gear. 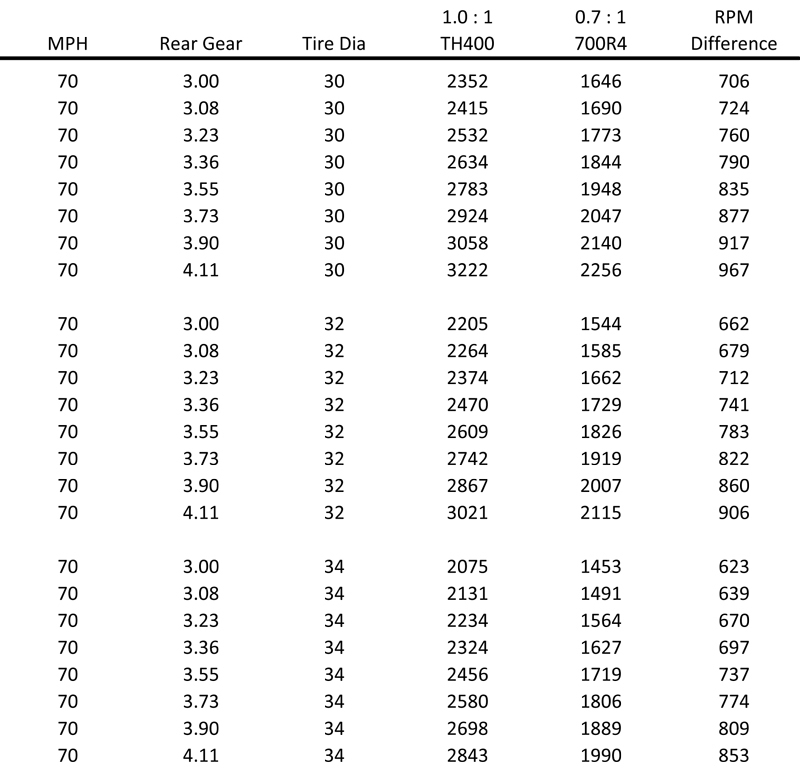 To give people a better idea of the effect, the bestway is to compare it to the th350 or th400 with the type of gears they ran yesteryear..... and look at the final ratio assuming the same tire height. 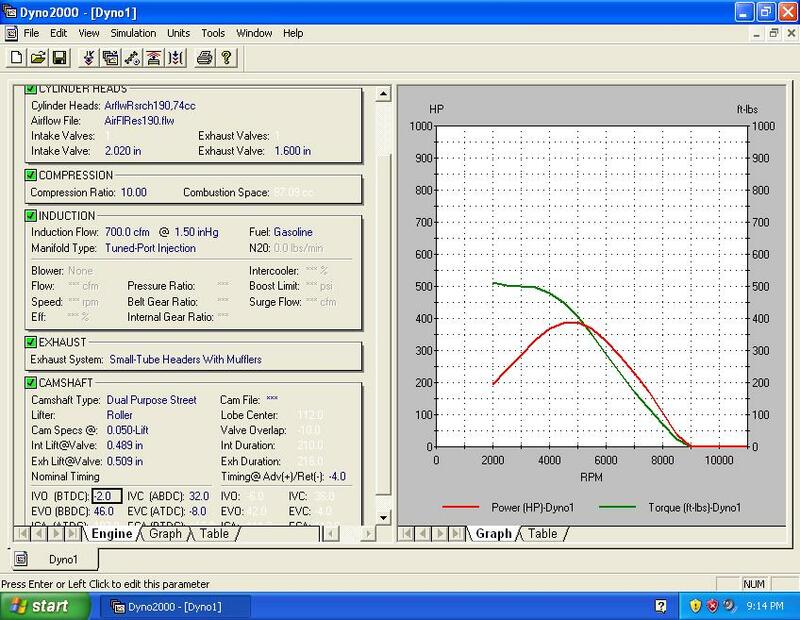 With a stock L98 motor that makes its HP peak even before 5000 rpm...... you just do not need much gear, you can actually be over gearing your motor to the point it accelerates too fast through your torque curve. Its hard for me to describe, but it happens all the time. 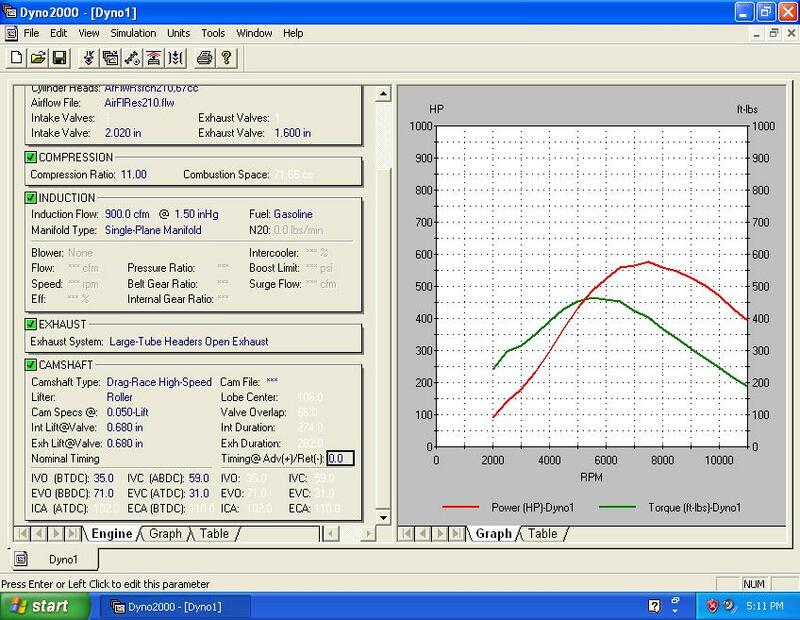 As a note, years ago, I did a before and after in-depth dragstrip test on a 3.07 vs 3.45 gears. I had been bracket racing the 3.07 gears for many years and knew my car to the hundredths.... I switched to the 3.45 gears, on the street after it was done, I would have swore my car was going to be faster at the strip...... then the weekend came and reality hit in the form of a timeslip that showed no difference in et's or traps at all..... in fact, I might have slowed down a hundredths, but hard to tell. This was on a 383 Superram motor that made a little over 400 HP with a HP peak in the mid 5000's. It too was a torque laden motor, but without a lot of HP and a tight rpm band, just like your TPI motor. The 3.07's are probably best for pure performance in your set-up if you have a slightly loose torque converter......which incidently, a good converter is more important than gear with your TPI motor. good luck with whatever you choose ! I like many of your old readings Grumpy. Lots of info. Like a Long Lost Treasure Discovered again. The Bolt on Overdrive Units have always been an option I like Grumpy. Gear Vendors comes to mind. Some minor fabrication to use one. Always wanted one for the 70 TA. Best of both worlds. Low Rear End Gears. 4.30-4.88. Hit overdrive button. 3 series gear again. Expensive still. But good to 2,000 HP. Awriteup on them by you recommended.